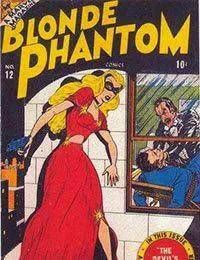 The Blonde Phantom (Louise Grant Mason) is a fictional masked crime fighter appearing in American comic books published by Marvel Comics. Created for Marvel predecessor Timely Comics, she first appeared in All Select Comics #11 (cover-dated Fall 1946), during the 1940s period fans and historians call the Golden Age of Comic Books. The character was ranked 98th in Comics Buyers Guides 100 Sexiest Women in Comics list.